« MTV VMA Awards – Anything is possible ! Take me to the LA Church! It’s been a huge whirlwind since we got the news that the Hozier video for “Take Me To Church” had been nominated for two MTV VMA awards. The video was produced at the end of 2013 by Feel Good Lost, my son Brendan Canty and Con Thomson’s company, on a shoestring budget. The video catapulted this unknown singer and his fantastic song to international success and nearly 330 million views later, we find ourselves heading to the awards at The Staple Centre, home of the LA Lakers in Los Angeles. Brendan and Con are the ‘talent’ so they got to experience the whole red carpet experience, while we had to go in a different door and sit a little further back in the audience. We were expecting a theatre full of the most fashion conscious, outrageous, “bling” people you could ever imagine but this wasn’t the case. Of course we saw a bunch of ultra-chic ‘where is my catwalk’ fashionistas at the event but we also saw a big crowd of very ordinary-looking people who looked like they were going to the cinema! The anticipation was building and the tweets were flying, with so many good wishes coming towards us from Cork and beyond, waiting to see if their huge success could be crowned even further. Hozier couldn’t be there and he tweeted the best of luck to the guys – even though the public vote was restricted to the U.S. many had tipped ‘Take Me To Church‘ as a winner so we had to start dreaming! We had a few chats beforehand about preparing a ‘winning speech’ or maybe two! I was trying to picture my boy up there with the stars saying something very profound about how “with the right passion anything is possible”. Maybe if he had enough time he would thank his dad profoundly for being the inspiration in his life and Cork might even get a mention?! The show started on cue and Miley Cyrus kicked off proceedings. We saw performances by artists we had never heard of, we saw lots of different and very provocative outfits by Miley, we saw footage from tandem outdoor performances from Downtown LA and we saw some of the awards being presented in double quick time by people including Britney Spears. There were breaks in the show every 15 minutes for TV adverts and stage preparation and there were even segments thanking the different sponsors. You knew this was a TV show first and foremost as everything seemed to be very rehearsed, even the banter and occasional exchange of insults between presenters. Taylor Swift was clearly the darling of the night with a huge entourage and lots of attention and focus on her – at least she had the class to bring on stage her video director who made his own speech. He had definitely rehearsed what he was going to say. 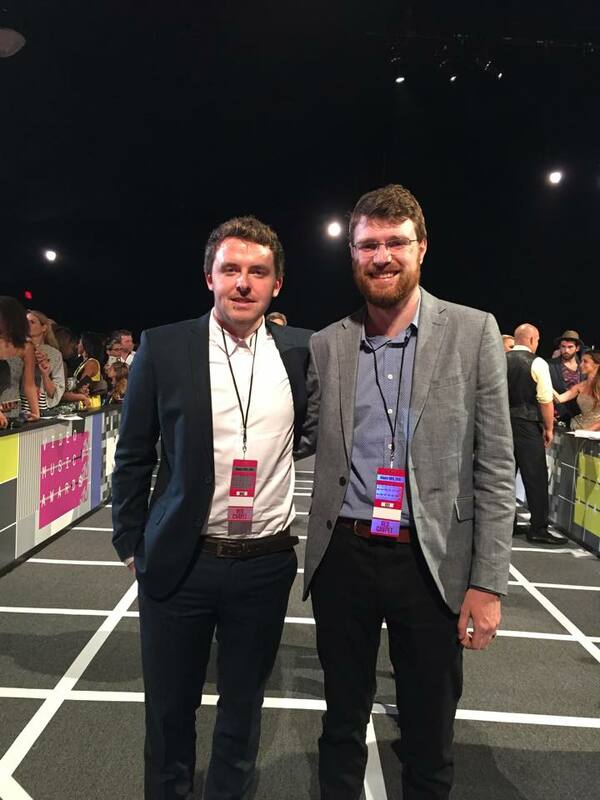 I started thinking about Brendan and Con going up on stage to accept an award and make a speech without a ‘star’. I was starting to have serious doubts as to whether this would not make for good TV. 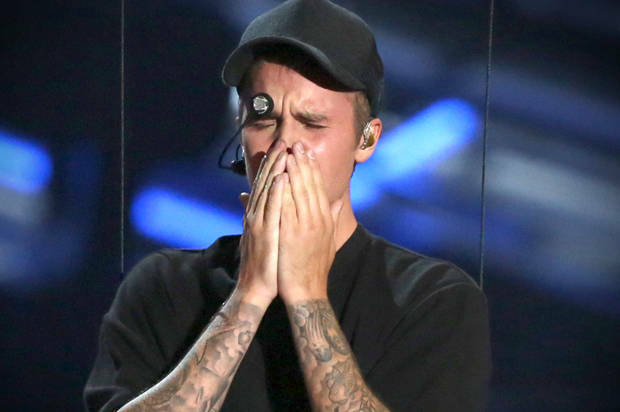 Justin Bieber starting crying after his emotional comeback performance – were those real tears? Kanye West grabbed many of the headlines for his ten minute confusing ramble about… I’m not really sure to be honest! He must be the most influential person in the industry as all the VIPs stood up for his speech and unfortunately for them they felt they had to stay standing. West was strangely nominated for an award and then went on to say how music awards are silly as no one should be there to be judged. To cap it all off he announced he was running for President in 2020. The breakfast chat with Kim will be interesting! 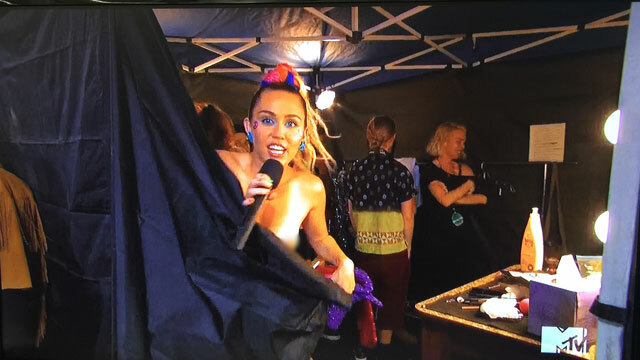 Miley Cyrus produced an accidental, totally on purpose revealing of her breast for the TV cameras, and then finished the night with a performance of her latest song. We looked at each other and wondered… what about the awards we were there for? We met with Brendan and Con who were just as confused. We discovered through twitter a band called Fall Out Boy had won Best Rock Video and were presented with that on the way into the show. Good video but it was watched 19 million times compared to the 330 million Hozier views ..I’m just saying! We also discovered that a guy called Colin Tilley won the award for ‘Best Direction’ for the Kendrick Lamar video. Apparently they never present these technical awards at the show as it is bad for TV. Dazed and confused, our gang trooped off to an official ‘After Party’ at a place called Henrys in West Hollywood but this 50-year-old was just too tired and managed one drink and called it a day. Los Angeles is a fantastic, unexpectedly friendly place, full of surprise and diversity and with an incredible amount to see and do. It is a place where anything is possible and anyone can become a star and even a bunch of Cork lads can walk the red carpet! This entry was posted on September 5, 2015 at 7:19 pm and is filed under Entertainment, Music. You can follow any responses to this entry through the RSS 2.0 feed. You can leave a response, or trackback from your own site. Sounds like you had a wonderful time – congratulations on your son’s success! Thanks Miriam – we had a ball !